Scene Stealer received its second review this morning. Miss Weidenmaier and I are pleased though I’m sure Miss Weidenmaier, a retired school teacher wishes everyone would pay more attention to their grammar and I’m afraid will never stop correcting people. Tomorrow is THE DAY. Scene Stealer will be published. Excited, nervous and pleased. 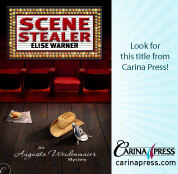 http://thebookbook.blogspot.com/2010/06/scene-stealer-by-elise-warner.html Stop by, take a look and leave a comment. This entry was posted on June 27, 2010 at 2:14 pm and is filed under authors, New Yorkers, Uncategorized, writers. You can follow any responses to this entry through the RSS 2.0 feed. You can leave a response, or trackback from your own site.